The zookeepers in charge of caring for little baby Squish, the flamingo chick, found themselves with a strange problem. While the baby flamingo needed to exercise, the Jurong Bird Park in Singapore was undergoing an intense heatwave. This made the stone walkways and concrete paths much too hot to walk on without some sort of protection. While Squish needed the exercise, letting him burn his feet outside was just not an option! Flamingos are built for walking on softer surfaces, such as sand or marshes. 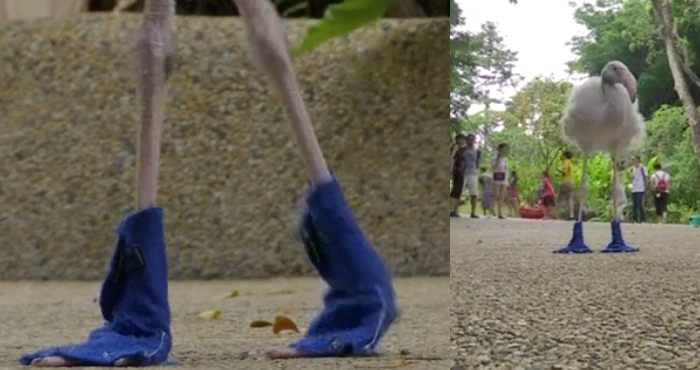 Unnatural surfaces, like the concrete pathways at the bird sanctuary were too harmful for the chick’s feet, so keepers created customized booties! Squish was found when he was still an egg, abandoned and alone. They cared for him until he hatched and have been doing their best to rehabilitate him and get him ready for a life in the wild. A nearby flock, estimated to be about 300 birds, are expected to adopt him once he is 3 months old and is able to feed and care for himself! Until then, he’ll use these booties on his daily walks.